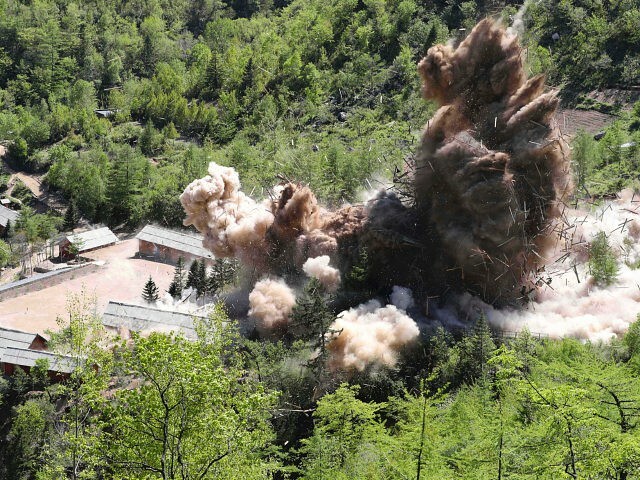 Chosun Ilbo cited a report using satellite imaging from the North Korean monitor site 38 North to determine that there is no indication of how deep the tunnels that North Korean officials fitted with explosives run, so it is likely that the explosives did not affect key parts of the site. The communist regime invited journalists from select countries, including the United States, to watch the detonations at the site, charging up to $10,000 per journalist to enter. The video did not offer definitive proof that the site was irreversibly damaged. “Commercial satellite imagery from late November shows that the two largest buildings at the Command Center remain intact … as do various nearby support facilities for personnel and security forces,” the report adds. The monitor site also dismissed reports that North Korea’s latest nuclear test in September 2017 irreversibly damaged Punggye-ri. “Contrary to numerous media reports, while previous nuclear detonations at the Punggye-ri nuclear test site may have necessitated abandonment of further testing directly under Mt. Mantap, they likely did not irreparably alter the integrity of geology in the adjacent mountains to the south and west where other test tunnels have been excavated,” the report reads. Mt. Mantap is the mountain under which the regime of dictator Kim Jong-il and son Kim Jong-un built tunnels to detonate nuclear weapons. At least one study using satellite imagery and topography estimates released in May, before the ceremonial closure of the site, found that Mount Mantap had lost up to two feet in height as a result of the six nuclear tests it had housed within. This led some experts to suggest that conducting another nuclear test at the site risked collapsing the mountain into itself entirely. The experts at 38 North recommend that, should North Korea allow any international inspectors on the site, they investigate how deep the tunnels that the government allegedly caved in go and look for evidence of walls built to hide secret passages. “One way to verify the extent of the collapse of each tunnel beyond just the portal areas would be to employ the use of heavy equipment like a mobile horizontal or vertical drill rig to verify just how far back a tunnel has or has not been collapsed,” the report recommends. The overall conclusion from the satellite images is that North Korea has clearly shut down its routine nuclear weapons work that defined the site before its shutdown in mid-2018, but that they could easily reverse this, and it is more accurate to say the site has been “mothballed” than completely dismantled. Secretary of State Mike Pompeo told reporters in October that the communist Kim regime appeared open to allowing international inspectors to visit the sit. Neither government has made overt movements towards international on-site inspectors arriving, however. In the time between Punggye-ri’s alleged shutdown and the latest 38 North analysis, a series of other investigations have surfaced that indicate North Korea continues to pour most of its finances into its military assets. North Korea has also independently claimed the invention of a “newly-developed ultramodern” which it has failed to describe in detail. “The testing of the high-tech tactical weapon has been carried out successfully, meeting all superior and powerful designing indicators,” the North Koreans claimed. None of the reports from the country suggested that the weapon in question had nuclear capacity. The investigations surfacing since the Punggye-ri display suggest investment outside of nuclear development. In October, the Cluster Munition Coalition, an NGO that specializes in the illegal weapon, revealed evidence that North Korea is continuing to build and stockpile them. Cluster bombs are conventional weapons that explode across a wide range of area, making them highly inaccurate and useful in killing large numbers of civilians. In September, NBC News cited several unnamed American officials who believed that North Korea had continued its nuclear weapons development. The officials became suspicious when they monitored the movement of North Korean nuclear warheads and found that they appeared to move from one facility to another without any visible purpose, suggesting moves meant to confuse foreign intelligence. “U.S. intelligence assesses North Korea could produce five to eight new nuclear weapons in 2018 … That pace is virtually identical to their assessment of the regime’s production of about six per year prior to the Trump-Kim summit,” NBC reported. That same month, 38 North unveiled evidence of activity at the Yongbyon Nuclear Scientific Research Center, a facility typically used to enrich uranium and develop other nuclear materials but not to test weapons. The site found evidence of deep dredging around one of the nuclear cooling towards, necessary if the site was indeed using nuclear material to harness energy.